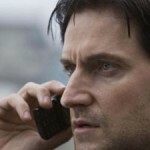 You are here: Home / Featured / Good Omens radio show – with photos!! Good Omens is coming to radio and I am struggling so much not to type this in all out caps (as I have been on Facebook and Twitter). “But Kate, this isn’t the first you’ve heard about it – they announced it a while ago,” I hear you say. And yes, they did. But they didn’t immediately release these amazing in-character photos and recording photos and ILLUSTRATIONS AND OH GOD IT’S HAPPENING AGAIN-!! Ok, so, for those of you that may not have heard of Good Omens (shame on you), it is a fantastic and hilarious and excellent book written by both Neil Gaiman and Terry Pratchett. Good Omens came out 1990. It contains a foreword from the authors (my slightly later edition does, at any rate) about how pleasing it is to be presented with battered and well-read copies of the book at signings, which is a really warming sentiment because the people who have read the book have done so so many times and still adore it. The story is about the end of the world, the impending apocalypse and those trying to stop it. The narrative follows several groups of characters and mostly alternates between the ‘adult’ and the ‘kid’ chapters, which I believe are written by Gaiman and Pratchett, respectively. The cast includes witches, devils, angels, harbingers of the apocalypse, children, an antichrist, nuns and normies (well, regular folk). I may have left someone out as I think I last read this near a decade ago, but trust me, it’s awesome. The last Gaiman radio adaptation I heard was that of Neverwhere (also excellent and brought to us by legendary and under-appreciated writer/director of nerdy radio glory, Dirk Maggs), so I have high hopes for the dramatisation of Good Omens – particularly given the cast. 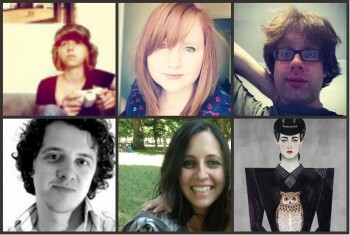 I am definitely still raving about (raving, flailing… people are getting annoyed). 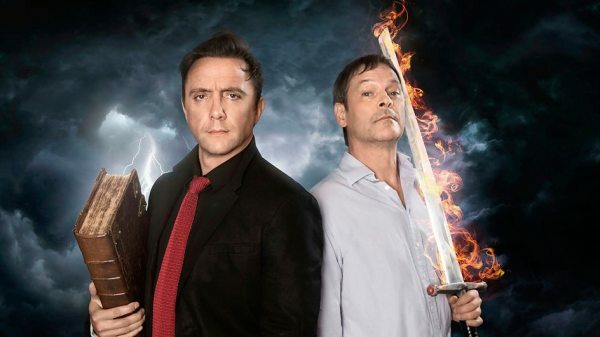 The hilarious and brilliant Peter Serafinowicz and Mark Heap are up as two of my very favourite characters of all time: Crowley (the fallen angel) and Aziraphale (an angel who runs a bookshop). 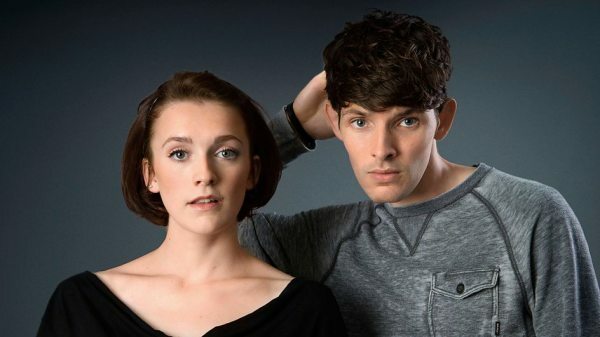 Joining them are Merlin’s Colin Morgan as Newt, Charlotte Ritchie as Anathema and Paterson Joseph (who was absolutely awesome as the Marquis de Carabas in the telly version of Neverwhere) as Famine, of Horsemen-of-the-Apocalypse fame. They’re joined by a lot of other excellent people, and Gaiman and Pratchett are doing a cameo as a pair of police officers early on. I CAN SCARCELY CONTAIN MYSELF. The show is due to begin airing on BBC Radio 4 (and available on iPlayer) on Monday the 22nd December at 11:00pm, so don’t miss it!! All photos are © BBC, from the BBC Radio 4 Good Omens page, which can be found at www.bbc.co.uk/goodomens – go there now to check out the full gallery as well as some gorgeous illustrations by Sean Phillips! !